Image © [caption id="" align="alignleft" width="301" caption="© secretlondon123"] [/caption] A few days after the Health and Social Care Bill went to the House of Lords and things are still looking rather grim. On Friday morning, Guardian articles focused on the Bill which is still with the House of Lords, and a response to it by Tim Montgomerie. For those wondering who Tim Montgomerie is, he is the Editor of Conservative Home - a grass-roots website for Conservative activists. As for the response, it was a blog about why David Cameron should kill the Health and Social Care Bill. While this may not seem like an earth shattering revelation, the idea Conservative Cabinet ministers are against the Bill is. So where does that leave NHS Reforms in general and do we need them? Certainly the current Bill is deeply unpopular and certainly seem as unnecessary by some, not the best start to changing the NHS. Personally I can understand why, I don't want healthcare which could en up being run by those who both profit off ill-health and don't want 'customers' - i.e. the American healthcare system. To continue on is most likely to cause huge collateral damage to the Conservative party, but to drop the Bill might be the equivalent of a bomb exploding your face - rather humiliating. However, as highly rated the NHS is, it certainly isn't perfect. Changes within the NHS will eventually need to be made, improvement of the NHS will need more input from both healthcare professionals and patients, but currently the voices of these groups are not as strong as they should be. I say should because for a healthcare system to be able to deliver high quality care it must be aware of the conditions its staff is experiencing, alongside the experiences and opinions of patients. I believe one thing which is true for all politicians, is the NHS is a well used organisation and any changes to it will need to be well thought out. Because whether you love the NHS or you hate it, it can be a toxic stain against your party if you don't handle it with the respect it deserves. 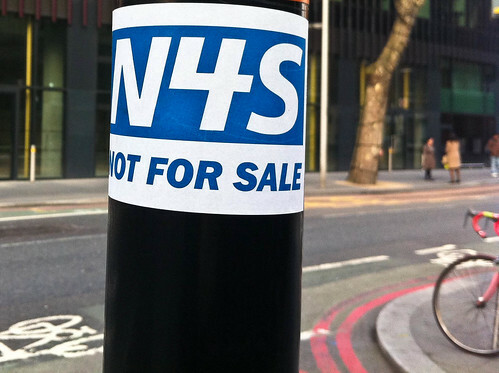 NHS Reform: is it necessary? A few days after the Health and Social Care Bill went to the House of Lords and things are still looking rather grim. On Friday morning, Guardian articles focused on the Bill which is still with the House of Lords, and a response to it by Tim Montgomerie. For those wondering who Tim Montgomerie is, he is the Editor of Conservative Home – a grass-roots website for Conservative activists. As for the response, it was a blog about why David Cameron should kill the Health and Social Care Bill. While this may not seem like an earth shattering revelation, the idea Conservative Cabinet ministers are against the Bill is. So where does that leave NHS Reforms in general and do we need them? Certainly the current Bill is deeply unpopular and certainly seem as unnecessary by some, not the best start to changing the NHS. Personally I can understand why, I don’t want healthcare which could en up being run by those who both profit off ill-health and don’t want ‘customers’ – i.e. the American healthcare system. To continue on is most likely to cause huge collateral damage to the Conservative party, but to drop the Bill might be the equivalent of a bomb exploding your face – rather humiliating. However, as highly rated the NHS is, it certainly isn’t perfect. Changes within the NHS will eventually need to be made, improvement of the NHS will need more input from both healthcare professionals and patients, but currently the voices of these groups are not as strong as they should be. I say should because for a healthcare system to be able to deliver high quality care it must be aware of the conditions its staff is experiencing, alongside the experiences and opinions of patients. I believe one thing which is true for all politicians, is the NHS is a well used organisation and any changes to it will need to be well thought out. Because whether you love the NHS or you hate it, it can be a toxic stain against your party if you don’t handle it with the respect it deserves.